Jose Mourinho praised the Manchester United support after his side's 3-0 defeat to Tottenham. Jose Mourinho came out fighting after Manchester United's 3-0 home defeat by Tottenham and insisted the players and fans are united behind him. Harry Kane's goal and two from Lucas Moura condemned United to a chastening Old Trafford loss which will do little to quash rumours of unrest at Old Trafford. But Mourinho pointedly stayed on the pitch to applaud the supporters who had sung his name towards the end of the match. And afterwards he claimed the performance of his players proved the solidarity in the dressing room as well as in the stands. "If anyone watched this game one thing they will know for sure, the team is united," admitted Mourinho. "A team doesn't fight like they fought if they are not united. I think it's time to stop with the untruths. A team that fights the way they did with the solidarity between the players, the dignity to play together for Manchester United and lose at home, of course it's a very difficult thing for anyone. Mourinho refused to single out any of his players for criticism after the game, claiming it was a much better performance from his side than their loss in Brighton a week ago. The Portuguese said: "We worked very well during the week. We prepared very well. We played very well (in training). The players had a fantastic attitude. "Everyone could feel that one goal could change the direction of the game. But then the third goal killed the game. "We worked all week and from a tactical point of view we didn't lose, but we lost the game." 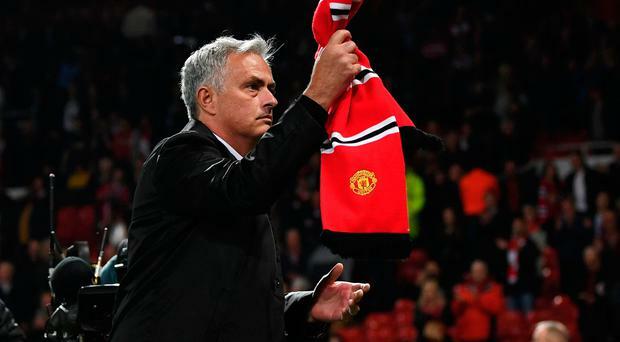 Mourinho also paid tribute to the fans at Old Trafford, who he went over and applauded for a long time after the game. "All our fans don't read papers, all our fans don't watch television, all our fans are more intelligent than that - they answered in an absolutely amazing way," he said. "I don't think it's normal to lose a game at home and have the supporters react like they did." However, the United boss' calm demeanour quickly changed in his post-match press conference when he was asked about the defeat. In an angry outburst, Mourinho responded to a question: "We lost against Sevilla (last season in the Champions League last-16) and we were booed because we deserved it. Today the players left the pitch after losing at home and they were applauded because they deserved it, so we keep trying, trying, trying." He then held up three fingers, before continuing: "What was the score? This. What is this also? Three Premierships I have won, more Premierships than the other 19 managers put together. Me three, them two. In contrast, Tottenham manager Mauricio Pochettino was understandably delighted with the result, arguing that his men were the much better side once they settled into the game. "It is a massive victory for us and I am very proud of the performance," boss Pochettino enthused. "It is difficult to beat Manchester United at Old Trafford. They were better in the first half but we dominated from then on, and the clean sheet was a bonus. "It is only the start of the season and we need to be consistent. We need to be realistic but want to keep pushing and building our fitness. A lot of our players have only had three weeks of training but we want to build something special. "This is my fifth year and I have a good relationship with my players. We have shared a lot of things over that time and the appreciation is normal. "We are in a very important period for our club with the new stadium and everyone is showing a big commitment." Spurs' double goal scorer Moura, meanwhile, was lost for words after leading his side to victory. The Brazilian winger struck twice in the second half to secure the three points, but he admitted the hard work won't stop with this result. "I said before the game we are able to win. I did very well tonight, I am so proud of my team-mates. I cannot explain what I'm feeling in this minute," Moura said. "I came to Spurs to win because I believe in the project, the club and the players. If we play like this every game... I know it's difficult, but we are able to win the Premier League and that's why I am here. "We are here - step by step to work hard. We will keep on working and let's see what happens."